Four Eyes Vol. 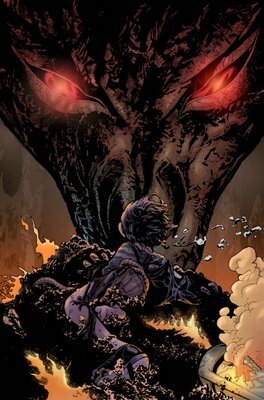 1: Forged In Flames by Joe Kelly and Max Fiumara. Published by Image Comics. Yes, that Joe Kelly. Deadpool Joe Kelly. Action Comics #775 Joe Kelly. Superhero workhorse Joe Kelly. It was with some reluctance that I picked up Kelly’s I Kill Giants last year. It had gotten LOTS of positive reviews, but I’ve never warmed to Kelly’s supehero work, and for better or worse I’ve always considered him to be not much more than a poor man’s Chuck Dixon. To my pleasant suprise, I liked it quite a bit, and it made me think that there might be an actual writer underneath the superhero shlock he had been peddling for years. So when Newsarama posted the first issue of his latest series for free, I was happy to give it a shot, and was more than a little shocked to find myself ordering the trade about 5 minutes later. 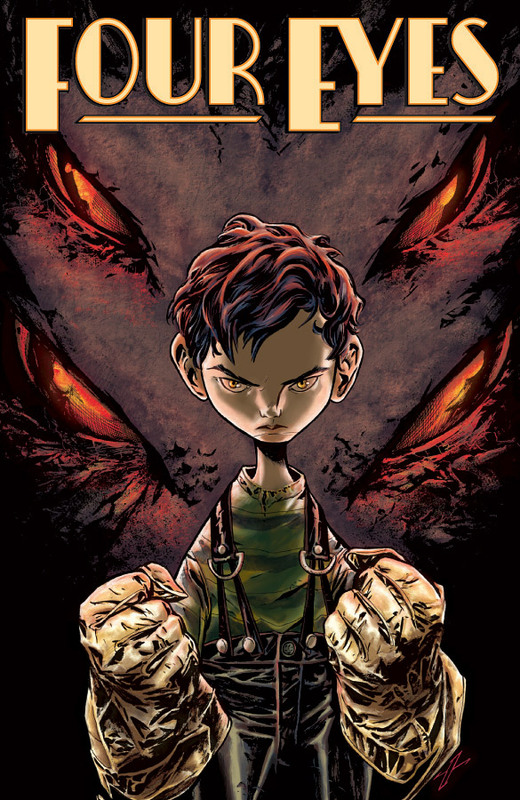 Four Eyes is the story of Enrico, a boy living in a Great Depression era Manhattan very much like ours, but with one exception: Dragons. They’re an endagered species, and as with anything that’s illegal, there’s a huge black market business to be had regarding the exploitation of said creatures. Enrico’s family is inextricably tied to these creatures, in more ways than one. This is a character story. Archetypical characters, to be precise, and a case could be made for some of them bordering on stereotype. There’s the plucky young hero looking to avenge the death of his father, as well as the grief-consumed mother, oblivious to her surroundings. We also have an honour-bound mob boss, and a wise old black mentor. Schlocky? Not on your life. These familiar characters are what makes this story work so well. I can’t say there are a lot of surprises, and the story progresses pretty much the way you think it would. It’s not the twists and turns that impressed me, it’s how artfully Kelly steers the ship. I couldn’t believe how sophisticated his pacing has become, and he always spends exactly the right amount of time on each character or story beat. While you might read a more original story this year, I doubt you’ll read one that’s laid out any better than this. Which brings us to the art. Although I’ve seen Max Fiumara’s stuff before, I had no idea he was capable of work like this. His human characters have a slightly cartoony feel that reminded me a little of Jeff Smith’s work on Rasl, and while I could see his style not working in other settings, it sets a perfect tone for this story. And then there’s the dragons. My god, the dragons. Fiumara has created some of the most beautiful monsters to be found outside of a Hellboy book. This is an excellent adventure story, with great character motivation, and a unique setting. The first four issues stand well on their own, but I can honestly say that I can’t wait to see what happens next. I’m also glad to rediscover a writer I had previously dismissed, and I’m looking forward to going back giving his previous work another shot. And possibly hating it even more, but there you go. This entry was posted in Comic Books and tagged Bone, Comics, Deadpool, Dragons, Four Eyes, Hellboy, Jeff Smith, Joe Kelly, RASL, Superman. Bookmark the permalink.